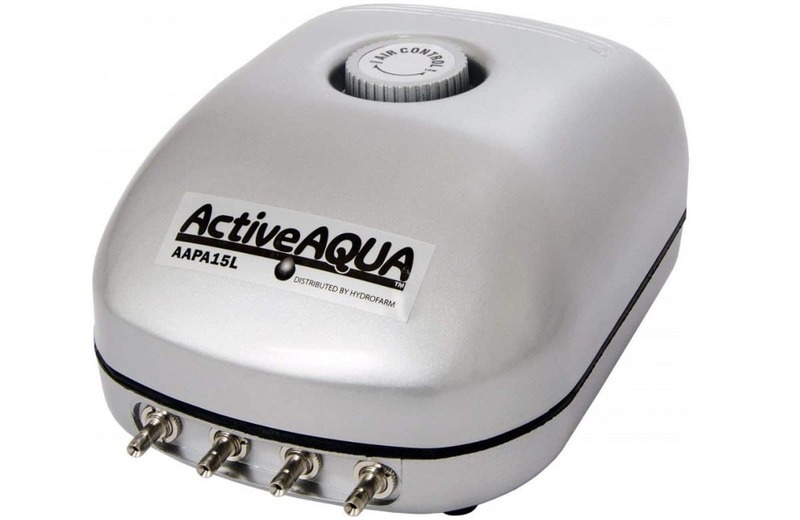 A hydroponic air pump can make the world of difference to your hydroponic growing success. There are many advantages to aerating your nutrient reservoir and increasing the supply of oxygen to the roots of your plants. 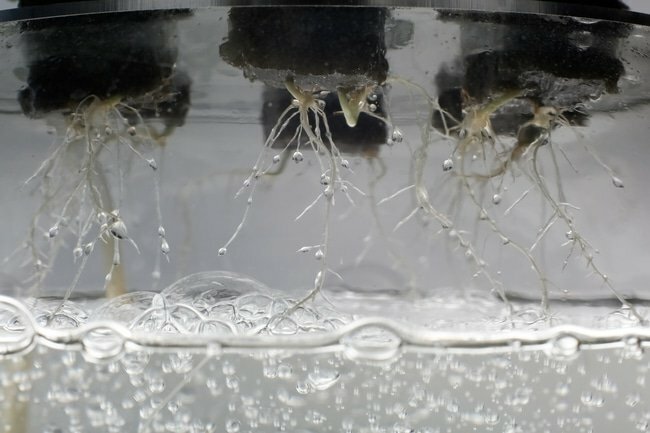 If you are unfamiliar with the effects of oxygen on plant roots and would like to learn more about hydroponics aeration, then read on. In this article, you’ll find out why plants need oxygen, discover the importance of dissolved oxygen in hydroponics, and gain some advice on how to get the best hydroponic air pump setup to help you grow healthier, happier plants in your hydroponic garden. It is common knowledge that animals breathe in oxygen and exhale carbon dioxide, while plants take in carbon dioxide and give off oxygen. But something many people don’t realize is that plants also need to take in oxygen. It sure seems contradictory. However, it makes sense, once you understand that plants carry out two processes that are the reverse of each other. There’s photosynthesis, wherein plants capture energy by manufacturing glucose and releasing oxygen, and then there’s cellular respiration, through which cells take up oxygen and break down glucose to release stored energy for their own use. Overall, the amount of oxygen used for cellular respiration is much smaller than the amount produced during photosynthesis. In fact, all living cells respire, usually by converting oxygen and organic compounds such as glucose and amino acids into energy while releasing water and carbon dioxide as byproducts. This is how most living things get the energy to carry out all of the process of life. The difference between animals and plants is that we get our glucose and amino acids and such by eating food, whereas plants make their own food through photosynthesis. Using light energy from the sun, plants convert carbon dioxide from the air and water they draw in through their roots into stored chemical energy, releasing oxygen as a byproduct. They can then use this oxygen for cellular respiration, but only in those parts that contain chlorophyll, and only when they have sunlight. The tissue in areas of the plant that don’t photosynthesize need to get all of their oxygen from their environment in order to carry out their functions. Plant roots need energy to find and deliver water and nutrients to the entire plant, and in nature, terrestrial plant roots get the oxygen to unlock this energy from pockets in the soil. However, too much water in the soil will drown the roots, depriving them of vital oxygen. This can lead to reduced permeability, toxic buildup, and nutrient starvation. So now that you understand why plant roots need a supply of oxygen, it’s easy to see why it’s so important to make sure your hydroponic system is providing plenty of it. Without an adequate amount of dissolved oxygen in the nutrient solution, plant roots will drown – especially in systems such as water culture where roots are immersed directly in the solution. Seeing as water already has oxygen in it – as in H2O –you may be wondering what dissolved oxygen is, and why hydroponics aeration is necessary. So here’s the deal: The oxygen atoms that form water molecules are chemically bound to those hydrogen atoms and are therefore unavailable to plants. But water can also contain molecules of two oxygen atoms bound together (O2). This form of oxygen is specified by terms such as diatomic oxygen, molecular oxygen, or dissolved oxygen. It may also be referred to as oxygen gas because this is how oxygen exists in the atmosphere. This is the form of oxygen that organisms use for cellular respiration; and dissolved oxygen is what sustains aquatic life across the planet’s oceans and waterways. Now, in addition to supporting the function of root systems and ensuring they don’t drown, there are several additional advantages to providing an abundance of dissolved oxygen in hydroponics. One advantage, as hydroponics growers using aeroponic systems are seeing, is that maximizing the exposure of roots to oxygen gas can dramatically improve their ability to absorb nutrients, resulting in faster, larger, and healthier plant growth. Another major advantage to ensuring that your hydroponic nutrient solution is well oxygenated is that it encourages the growth of beneficial microorganisms such as nitrogen-fixing bacteria in the root zone and discourages the growth of pathogens that cause root rot. What Affects The Oxygenation Of Nutrient Solution? There are several factors that will affect the level of dissolved oxygen in your nutrient solution. One important factor is water purity. The mineral content of the source water, salinity, and concentration of added nutrients will all reduce the amount of oxygen that the liquid can hold, while organic contaminants such as bacteria will consume some of the oxygen content of the solution. The best way to avoid these effects is to send your source water through a reverse osmosis filter before placing it in your reservoir. This will help ensure that your nutrient solution has optimal amounts of both oxygen and nutrients for your plants. To learn more about hydroponic nutrient solutions, read my in depth article here. To maintain optimal amounts of oxygen, you also need to understand the impact of temperature on dissolved oxygen levels in your nutrient solution. As the temperature of the solution increases, it becomes less able to hold dissolved oxygen. Additionally, the rate at which root tissue respires increases as it gets warmer, which requires more oxygen. On the flip side, the ability of roots to uptake water and nutrients decreases as they get colder. The important thing to keep in mind is that about 68-72 F (20-22 C) is the ideal temperature range for promoting the root health of most plants. How Do I Increase Dissolved Oxygen In Hydroponics? You can increase the amount of available oxygen in a hydroponic system by making sure you provide good aeration in the root zone of your plants. One way to do this is to use growing media such as grow stones, perlite, or coco coir chips. Read more about picking the best growing media. Another method to enhance the amount of dissolved oxygen in the nutrient solution by vigorously circulating it, which brings it into contact with the surrounding air so it can absorb more oxygen from the air. There are a couple other methods as well, but the safest and most effective way to increase the amount of oxygen available to your plant roots, short of building yourself a full-on aeroponic system, is by aerating the nutrient reservoir with an air pump and air stones. Why Do I Need A Hydroponic Air Pump? So, we’ve established the many benefits of aerating your nutrient reservoir; but is installing a hydroponic air pump truly necessary for a successful hydroponic garden? If you’re using a deep water culture system, the answer is usually yes – an air pump is a crucial component of this type of hydroponic system, since plant roots are constantly in contact with the nutrient solution. 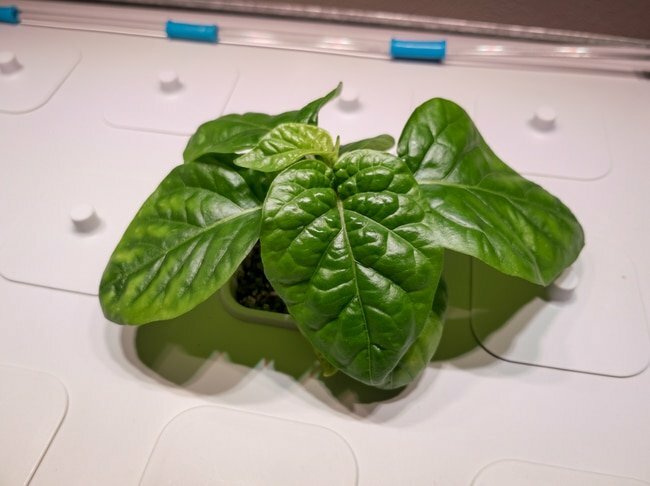 You can get by without a hydroponic air pump if you just want to build a very simple wick, drip, or Kratky system – as long as you’re willing to accept lower productivity and higher risks of disease and oxygen starvation. If you’re building an active hydroponic system such as nutrient film technique or ebb and flow, you may be able to provide sufficient aeration by designing it to create vigorous action in the nutrient solution by means such as the way it’s poured into the reservoir. But to achieve the promises of faster growth, larger plants, and better yields that are central to the concept of hydroponics, you need to install an air pump to aerate your nutrient reservoir. What Equipment Do I Need For Aerating My Nutrient Reservoir? The best hydroponic air pump setups have three components: the air pump, the air stones, and the tubing. The air pump usually sits outside the nutrient solution reservoir and pumps air through plastic tubing to the air stones located at bottom of the reservoir, which diffuse the air into many small bubbles. Hydroponic air pumps can create disturbing vibrations and obnoxious noises, so check the pump specifications for a decibel level below 45 and look for sound-reduction and oscillation-baffling features. Keep an eye out for features such as adjustable airflow and multiple outputs that will allow you to adapt your air pump to different needs and changing situations. Hydroponic air pumps usually run 24/7, so you should check out the durability specs of any air pump you’re considering. If you are starting out small and planning to expand your hydroponic system later, it may be worthwhile to go with an air pump that’s a bit larger than you presently need. Energy economy. To help minimize the energy consumption of your hydroponic system, check out some of the power-saving and eco-friendly air pump options on the market. To calculate the size of a hydroponic air pump, you need to know the size of your nutrient solution reservoir. For simplicity, you can estimate that you will need 1 watt per gallon of solution, although that will give you more pumping power than you really need. For a little more accuracy, about 500 cubic centimeters (0.5 liters) per minute of air for each gallon is a good range for most home hydroponic systems, unless it’s a very complex setup. When your hydroponic grow room is set up in your home, buzzing, humming, and vibration coming from your air pump can be a major nuisance. Many hydroponic air pumps are equipped with features to mitigate these problems; but if you’re air pump doesn’t have such features, there are a few hacks you can try to help restore peace and tranquility of your abode. To begin with, you can have your pump serviced to make sure all the inner parts are set in tightly. Also, try surrounding the pump with polystyrene or some other sound-killing material, especially underneath the pump. For a hackier hack, try a cardboard box padded with bubble wrap. Just make sure you don’t block the air intake!Setting the pump on foam padding or a blanket are other simple ways you can prevent vibration. Or consider hanging it by a bungee cord. Should I Run A Hydroponics Air Pump All The Time? Running your air pump constantly is actually better for the pump than turning it on and off, so you will not only avoid stressing your plants with fluctuating dissolved oxygen levels, but also extend the life of your pump by running it 24/7. You can turn it off occasionally if you need to, but it should only be for short periods. For the best hydroponic air pump setup, you should use nontoxic, garden-safe plastic tubing to carry the air from the pump to the air stones. Aquarium tubing is great for this. Be aware of the color of your tubing, and choose black or another dark color rather than clear tubing to prevent the development of algae. 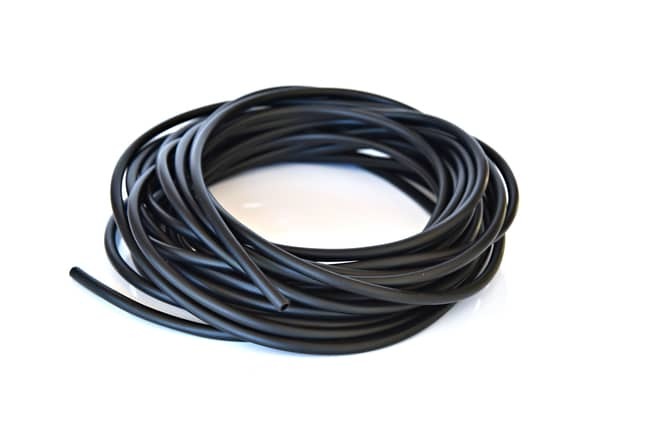 And be sure to purchase plenty of air tubing so you will have more flexibility in locating your pump as well as hooking up multiple reservoirs and air stones. Anyone who’s had an aquarium is probably familiar with air stones, which create tiny bubbles to provide oxygen for the fish. They’re made of a porous material such as volcanic rock and come in many shapes and sizes. An air stone for hydroponics is similarly used to diffuse oxygen in the nutrient reservoir. The many small bubbles they produce increase the surface area of the air that’s pumped into the reservoir to provide more contact with the solution, thus increasing the level of diffused oxygen. Smaller bubbles are also less buoyant than larger ones, so they rise from the bottom of the tank more slowly, giving them more time to allow even more oxygen to dissolve. In general, the more bubbles, the better, unless you’re having problems keeping your solution from becoming too hot. Air stones are great for hydroponics aeration because they’re inexpensive and easily available. The size, shape, and number of air stones you need will depend on the dimensions of your reservoir and the airflow rate of your pump. 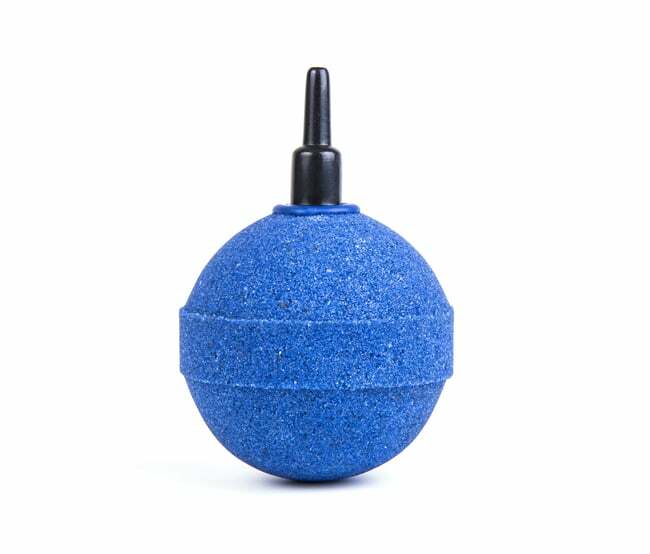 To get the widest, most even spread of bubbles in your reservoir, place a single air stone in the center; or for larger tanks, disperse multiple air stones evenly around the floor of the reservoir. Here’s a great article from GroWell which explains a bit more about air stones. Let me know what your experiences are with aerating your hydroponics system in the comments section below. Have you any tips to share or or questions about aeration of your nutrient reservoir?